Chrysler may have led U.S. automakers with a 48 percent sales increase, the average of six analysts' estimates, helped by higher deliveries to fleet customers. 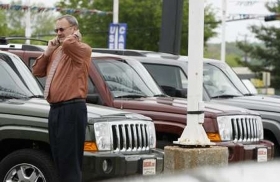 DETROIT (Bloomberg) -- U.S. light vehicle sales in September may have run at the fastest pace since March as consumers returned to showrooms, helping the industry's recovery from the worst year in almost three decades. Industrywide deliveries, to be released tomorrow, may have reached a seasonally adjusted annual rate of 11.7 million vehicles this month, according to nine analysts' estimates compiled by Bloomberg. That would top the 9.5 million pace of last September, the month after the U.S. “cash for clunkers” program ended, and would approach the 11.8 million rate posted in May -- the year's best month so far, according to the Automotive News Data Center. Automotive News calculates the annualized sales rate differently than other news and data providers. Consumers are slowly returning to dealers' showrooms while remaining concerned about the security of their jobs, said Paul Ballew, chief economist for Nationwide Mutual Insurance Co. in Columbus, Ohio. Deliveries for all of last year fell to 10.4 million, the lowest since 1982, compared with the average 16.8 million vehicles a year from 2000 to 2007. “It confirms to us that the recovery has gained a little bit of momentum in the third quarter and is somewhat back on track, but it is still a very slow recovery,” Ballew, a former General Motors economist, said in a telephone interview. The Conference Board reported on Sept. 28 that consumer sentiment this month declined to the weakest level since February. The U.S. unemployment rate was 9.6 percent in August, up from 9.5 percent in July. Chrysler Group may have led U.S. automakers with a 48 percent sales increase, the average of six analysts' estimates, helped by higher deliveries to fleet customers. Ford Motor Co. may post a 40 percent sales increase, the average of six analysts' estimates. Deliveries by General Motors Co. will rise 13 percent, the average of three estimates. GM's market share will fall to 18 percent, one of its lowest levels since World War II, according to TrueCar.com, an automotive pricing Web site. Edmunds.com expects GM to hold 18.3 percent of the market. “GM has some hot new models, but also some older vehicles that they need to replace or get rid of,” said Ivan Drury, an Edmunds analyst. Consumers are buying new cars and trucks largely because they must replace vehicles that have come off lease or broken down, said Jeff Schuster, executive director of forecasting at J.D. Power & Associates in suburban Detroit. The worst recession since the 1930s ended in June 2009, the National Bureau of Economic Research's Business Cycle Dating Committee said Sept. 20. Sales to individual consumers, as opposed to fleet buyers such as rental-car companies, may rise to a 9.5 million pace, the average of four analysts' estimates. That would be the first time since mid-2008 that the retail rate exceeded 9 million vehicles for three straight months, Chris Ceraso, a Credit Suisse AG analyst, said in a Sept. 28 note. Fleet sales will account for 19 percent of deliveries, up from 16 percent in August, Ceraso said. Small businesses and fleet customers may have contributed to higher truck sales, said Joe Barker, senior manager of North American vehicle sales forecasts at IHS Automotive, a Lexington, Mass.-based researcher. “They put a lot of miles on them every year and they beat them up every year and it's time to replace them,” said Barker. Tight credit for some consumers restrained deliveries, with buyers who missed mortgage payments being denied or asked to prepay as much as 30 percent of the sticker price, said Jesse Toprak, vice president of industry trends for TrueCar. Ford was the only U.S. automaker to raise incentive spending, TrueCar said. Ford's average discounts rose 7.4 percent from last year to $2,797 per vehicle, while Chrysler decreased incentive spending by 23 percent to $3,787 and GM cut them by 11 percent to $3,403. Honda Motor Co.'s sales growth may have outpaced its Japanese rivals. The automaker's deliveries may have risen 32 percent, according to four analysts' estimates. Nissan Motor Co.'s sales may have climbed 30 percent and Toyota Motor Corp.'s may have increased 21 percent, according to four estimates.